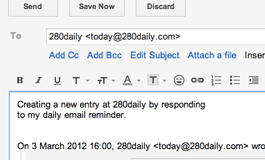 You can create new entries and update existing entries by replying to your email reminders. 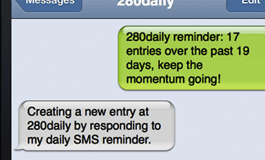 You can also start a new email and send it to today@280daily or yesterday@280daily.com. UK, USA and Canadian users have the ability to receive SMS reminders either daily, every other day or weekly. We'll be bringing SMS features to additional countries later this year, subscribe to the blog for updates. 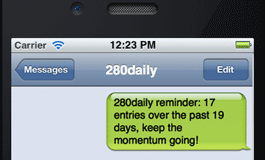 280daily is in many ways a journal for non-journal people. Now seasoned writers who are too constrained by 280 characters can set their own limit. You can also add as many characters as you need on the fly. 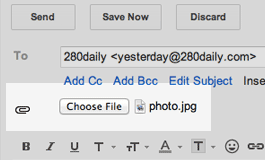 You can also attach a JPG or PNG image to your email. This is the quickest way to upload images from your smartphone or tablet. You can attach along with your entry or append it to an existing entry. UK, USA and Canadian users have the ability to create entries via text message (SMS). Multiple updates throughout the day are appended to that day's entry. We'll be bringing SMS features to additional countries later this year. Some users have separate logins for different areas of life (e.g. personal and business). This feature enables you to switch accounts with just one click. When linked, PRO is activated across accounts. All 280daily themes are available to PRO users. You can try them out by visiting the themes section in your settings. PRO users have full access to Timeview, an easy and intuitive way of navigating your entries. To preview Timeview, click here. 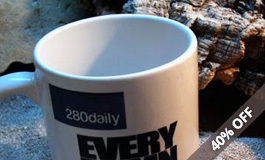 PRO users automatically receive 40% off the 280daily mug. Delivery costs vary depending on location. Please get in contact if you have any questions. PRO user book purchases are automatically discounted 10%. Increase in photo size limit, from 2MB to 5MB per upload. 30 day login activity retention with failed login attempts recorded. Top priority support, contact us if you have any questions.